Study Looks Into Oral HPV Infections In US Men, Women. NBC News (10/17, Fox) features information from Dr. Erich Sturgis, professor of head and neck surgery at the MD Anderson Cancer Center at the University of Texas, who highlighted how the center and the American Dental Association are collaborating to prevent oropharyngeal cancers. Today at ADA 2017 – America’s Dental Meeting, the ADA and the University of Texas MD Anderson Cancer Center are hosting a joint symposium to address the relationship between HPV infection and oropharyngeal cancer. The ADA has released an updated oral cancer clinical practice guideline, and Dr. Mark Lingen, chair of the guideline’s expert panel, will present the guideline’s recommendations during a talk, ADA Clinical Practice Guidelines on the Evaluation of Oral Cancer (6809), on the ADA Science Institute Stage at ADA 2017 – America’s Dental Meeting on Friday, Oct. 20. In addition, the Oral Health Topics on ADA.org and MouthHealthy.org provide information on oral and oropharyngeal cancer for dental professionals and for patients. MouthHealthy.org also provides information for patients on HPV and oral cancer. When it comes to teeth whitening, you may see many different methods featured online and in magazines—from oil pulling to charcoal, and even turmeric. It's no surprise that DIY whitening is top of mind, either. When the American Academy of Cosmetic Dentistry asked people what they’d most like to improve their smile, the most common response was whiter teeth. The approach maintains you can make your teeth whiter and brighter using household staples that are naturally acidic (like lemons, oranges, apple cider vinegar), contain digestive enzymes (such as pineapple or mango) and something that is abrasive (like baking soda). These methods claim that scrubbing your teeth with ingredients like activated charcoal or a baking soda-hydrogen peroxide paste will bring a shine back to your smile. There is no evidence that shows dental products with charcoal are safe or effective for your teeth, according to the September 2017 issue of the Journal of the American Dental Association. Also, using materials that are too abrasive on your teeth can actually make them look more yellow. Enamel is what you’re looking to whiten, but if you’re using a scrub that is too rough, you can actually wear it away. 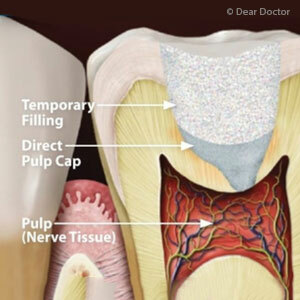 When that happens, the next layer of your tooth can become exposed – a softer, yellow tissue called dentin. Instead, choose a whitening toothpaste with the ADA Seal of Acceptance. The Seal lets you know the toothpaste you choose is safe, effective and won’t damage your teeth. Swishing oils like coconut oil in your mouth (oil pulling) or using spices like turmeric can help whiten your teeth. There is no reliable scientific evidence to show oil pulling or turmeric whitens teeth. Save the oil and spices for healthy meals instead. If you want to try a specific whitening product or service, just talk to your dentist before you begin. There are at-home bleaching options that have earned the ADA Seal of Acceptance, which means they’ve been tested to be safe and effective for your teeth. Get a list of all ADA-Accepted at-home bleaching products. Whitening may not work on all teeth, and if you are a candidate, some methods—whether at-home or in the dental office—may be better for your teeth than others.